$18 advance; $22 day of show. At the crossroads of blues and American roots music youll find Brooks Williams. Setting new standards and a fresh direction for the blues, says Blues In Britain, and creating a beautiful fusion (Keys And Chords). Just when you think he cant sing a blues-ier note, he sings it. Just when you think he cant strum a deeper groove, he strums it. 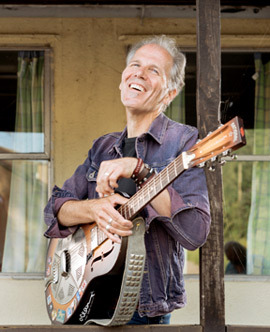 Brooks was born in Statesboro, Georgia, USA (the town made famous by the classic song Statesboro Blues), and did his apprenticeship in the small bars and coffeehouses of New York and Boston, following in the footsteps of Chris Smither, Rory Block, Shawn Colvin, Maria Muldaur, David Bromberg and Leo Kottke, all whom he gigged with from time-to-time when he was starting out. The result of those early years is an unflagging career that goes from strength to strength. Lucky Star, Williams 28th solo recording, is already turning heads and making itself known on playlists throughout the world. The Second Line groove that runs throughout every track would make the late Allen Toussaint proud. Ranked in the Top 100 Acoustic Guitarists, hes a mean finger-picker and a stunning slide guitarist. Plus, he has a beautiful voice, says AmericanaUK, that you just melt into. That voice earned Brooks a nomination for Best Male Vocalist by Spiral Earth, one of the UKs most respected roots music publications.